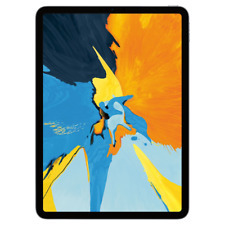 Apple iPad Air - A1474 Black and Space Gray. 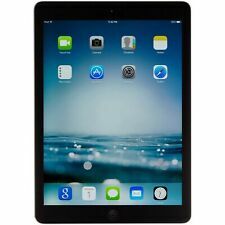 Apple iPad Air 1st Gen 9.7" 32GB MD786LL/A Space Gray Wi-Fi iOS 12 Amazing Deal. iOS: 12.1.4. Storage Size: 32GB. Part# MD786LL/A. Includes USB Lightning Cable Only. MicroSD/SDHC card slot (supports up to 32GB). Detachable Keyboard. Includes detachable keyboard w/two built-in Type A USB ports. USB Type-C to AC power adapter. Power Adapter Specifications Power button. Item is a Samsung Galaxy TabPro S. • 4 GB RAM. • Win 10 Pro. • Keyboard is included but DOES NOT WORK. 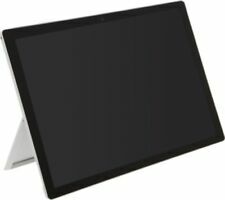 • 12" OLED Super AMOLED touchscreen 2160 x 1440 ( Full HD Plus ). • Bluetooth. This item is professionally tested and is fully functional. Features: Model: Fujitsu Stylistic Q704. GOOD CONDITION WITH NORMAL WEAR. 2-IN-1 CONVERTIBLE TABLET/ LAPTOP, KEYBOARD AND STYLUS INCLUDED. •Stereo global headset jack. •Bluetooth 4.0. •Micro USB 2.0 (1). Samsung Galaxy TabPRO SM-T900 32GB, Wi-Fi, 12.2in - Black, Small Problem, Works! But the screen has a thin faint yellow line on the left edge. (See pictures). It has no effect on the use of the tablet. The pen is included. The screen is NOT cracked. The screen has only a few very tiny very light scratches. 4.5 out of 5 stars - Samsung Galaxy TabPRO SM-T900 32GB, Wi-Fi, 12.2in - Black, Small Problem, Works! 101 product ratings101 product ratings - Samsung Galaxy TabPRO SM-T900 32GB, Wi-Fi, 12.2in - Black, Small Problem, Works! Trending at $973.83eBay determines this price through a machine learned model of the product's sale prices within the last 90 days. Policy covers functional defects only. Tablet in good condition overall. Light scuffs or scratches on that back cover. 100% original and working or your money back. Trending at $544.70eBay determines this price through a machine learned model of the product's sale prices within the last 90 days. This handy tablet runs Windows 10 software, making it compatible with most programs on the market. 4GB of RAM. Make: Microsoft. Stylus Not Included. Product Type : Tablet. Processor Type : Core i5. Form Factor : Slate. Android 6.0 Marshmallow. Battery Life. Manufacturer Part Number. Samsung ATIV Smart PC 500T 2GB 64GB Wi-Fi 11.6" Tablet PC Win8 - XE500T1C-A04US. 1x Samsung ATIV Smart PC XE500T1C-A04US Tablet. Manufacturer Samsung. UPC 887276009605. 1x AC Adapter. As pictured. Excellent condition. Comes with original box. Charger not included. Shipped with USPS Priority Mail. 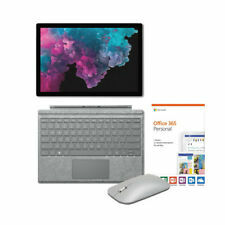 Microsoft Surface Pro 3 128GB, Wi-Fi, 12in - Silver. Condition is Manufacturer refurbished. Shipped with USPS Priority Mail. Trending at $279.99eBay determines this price through a machine learned model of the product's sale prices within the last 90 days. Wifi Only. Condition is Used. There are two tiny scratches on the screen but not visible when it's on. Apple iPad Pro 2nd Gen. 256GB, Wi-Fi (Non CA Versions), 12.9in - Silver. Condition is Used. Note ding to top right corner that does not affect usability and should be covered by any case. I note no other damage but this is a used iPad and may have other light scuffing. Included are the shown keyboard case and charger - both third party. Settings show Applecare until July 2020. IPad is in very good condition, no screen imperfections, device functions normally. This device has never been dropped or banged, has no dents. - Apple front smart cover and back case included. Back case has two cracks at the edges from wear. Apple iPad Pro 2nd Gen. 64GB, Wi-Fi, 12.9in - Space Gray. Refurbished Tablet in Very Good condition. You're getting a great device at a great price! USB Charging Cable. The item doesn't include original box. Trending at $580.00eBay determines this price through a machine learned model of the product's sale prices within the last 90 days. Product Key Features. Color Black. Manufacturer Color Black. Internet Connectivity Wi-Fi. Resolution 1366 x 768. Processor Quad Core. Type Tablet. Trending at $72.47eBay determines this price through a machine learned model of the product's sale prices within the last 90 days. In addition, this tablet supports the Smart Keyboard and the Apple Pencil. Cracked Corner(See Pictures). Scratches and Scuffs On Body(See Pictures). Normal Wear and Tear. Good Condition. 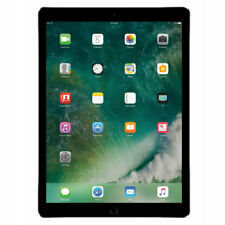 Apple iPad Pro 1st Gen. 128GB, Wi-Fi Cellular (Verizon), 12.9in - Space Gray. Condition is Used. This ipad is in good used condition, there are surface scratches on the back from normal use and some wear on the screen on the edges (it looks like from where it was in a case). This device has been factory reset and is free from any pass codes and iCloud accounts. Please feel free to message with any questions. Modern tablets come equipped with high processing power and advanced functionalities enabling you to stay productive while on the go. With the right tablet, you can enjoy the portability of a tablet and the functionality of a laptop. What Factors Should You Consider When Choosing a Tablet? With so many tablets available in the market, picking the right one can be quite a challenge. Below are some of the points you should bear in mind. Operating system: You can choose between Windows, iOS, and Android platforms. The operating system you choose will to a great extent determine your tablet's functionalities. Apple and Google app stores by far offer more business app choices than both Windows and Amazon's Fire OS. If your business has high-level compliance or security needs, then Windows is likely the most ideal option. With the OS, you're essentially getting the full desktop version on a tablet. Processor: The performance of your tablet is largely determined by the processor. When looking at the processor, you should consider the processor speed, expressed in GHz and the number of cores. The higher the number of cores, the more your tablet will be able to "spread the load" and the better it will perform. Most 11 to 12.9-inch Windows business tablets come with Intel dual-core or Intel quad-core processors. Memory: Generally, the higher the RAM the better. You'll want to aim for 2 to 3 GB RAM for Android tablets and 4 to 8 GB for a Windows tablet. Screen: Most business tablets fall in the 11 to 12.9-inch category. A larger tablet will offer you ample work space as well the opportunity to attach a full-sized keyboard. Storage: The right storage capacity will likely depend on your usage. If you happen to run resource-heavy business programs and store large files, you should opt for a larger capacity. Connectivity: Does the tablet come with built-in LTE or Wi-Fi capability? You should also consider whether the tablet supports HDMI and micro-SD connections. What Are the Pros of 11 to 12.9-inch Tablets? Portability: Tablet computers offer a compact alternative to notebooks. The devices are thin and light, making them ultraportable. Battery life: The tablets are more energy efficient and can last hours on a single charge. This can come in handy when you are on the move or when you have limited opportunities to recharge your battery. Content provided for informational purposes only. eBay is not affiliated with or endorsed by the brands listed above.